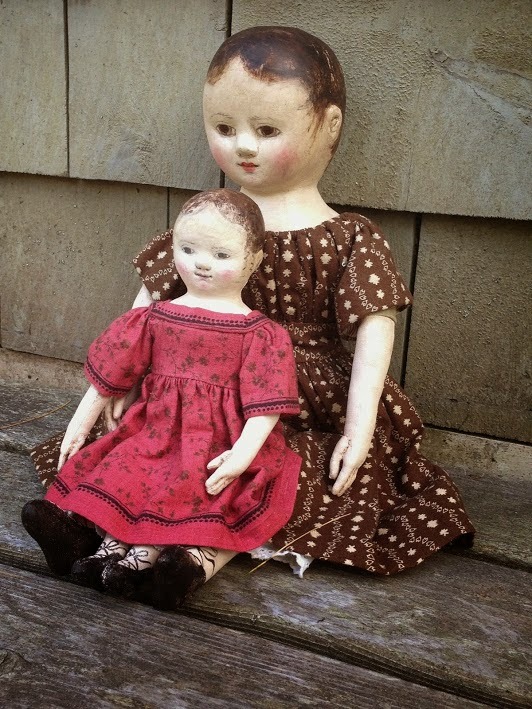 In the spring, Janie and Temperance traveled to California, where they were photographed to be featured in Art Dolls Qarterly's Autumn 2014 issue. 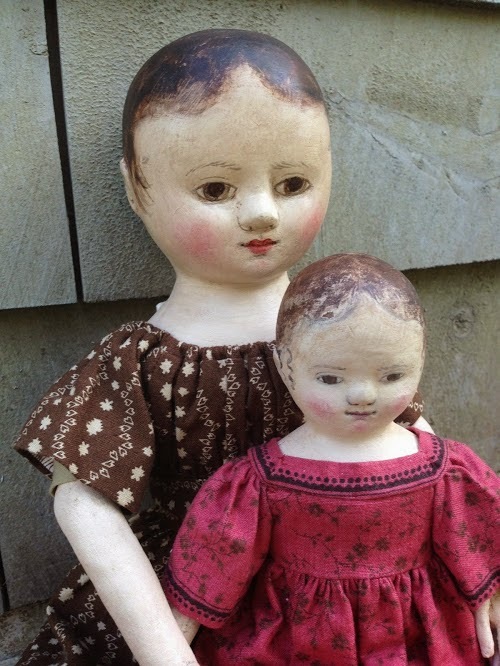 It was fun to make a smaller and larger doll, and they fit together perfectly, the way sisters do. I wrote an article about the process I use in making these one of a kind sculpted dolls. My name is even on the cover. 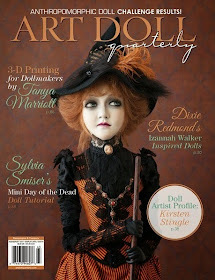 Click the magazine cover to visit Art Doll Quarterly's site. 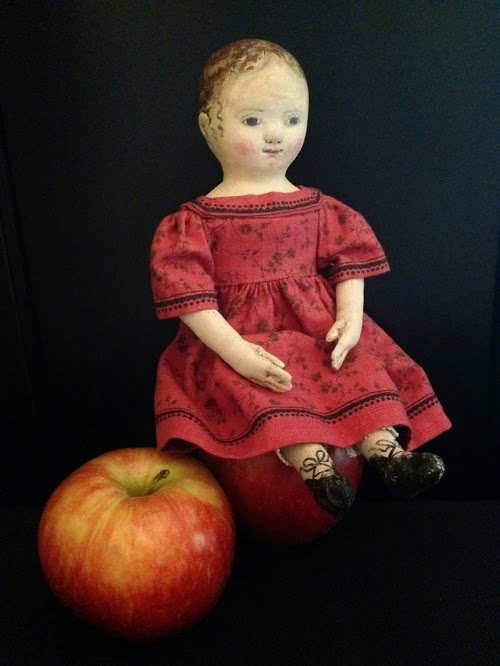 Janie, the little doll in red, measures 9" tall. She is a one of a kind doll, sculpted from paper clay with a stockinette layer over the clay. Her dress is made from a Moda fabric. I have used a printed selvedge to create a trim for her dress. The dress is sewn closed in the back and is NOT removable, unless you unstitch the back. She wears pantaloons that are stitched from antique lace. and is the second two mini Izannahs I have made. 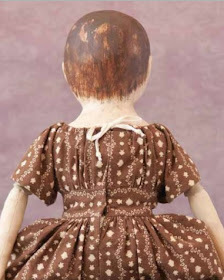 For a while I have been working on a pattern from my antique Izannah Walker doll, who measures around 16" tall. Temperence has been very patient with all my fussing and prototype making. 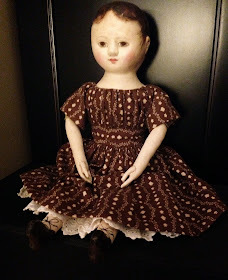 She is the first doll I've made from this pattern. She is shaped slightly differently from my first izannah pattern. Temperance wears a dress made from reproduction cotton quilting fabric. The dress has a casing and drawstring closure at the neckline. Temperance wears a petticoat made from antique lace. She has a body covering underneath the clothing, as original Izannah Walker dolls do. She is hand sculpted and not made from molds, although I did use measurements from my original antique doll in making her. She is lovingly painted with quality artist acrylic paints, and does not have a stockinette covering. Shipping within the U. S. is included in the purchase price. Purchasers outside the United States will pay for shipping as quoted.